Given the subject matter of Cobb’s book (and my interest in it), I didn’t expect a light read. I also didn’t expect just how dense his ideas can be at times. Much of this chapter, and this book, actually, hinges on his use of an important concept, that of a jeremiad. According to the Merriam-Webster dictionary, a jeremiad is “a prolonged lamentation or complaint; also: a cautionary or angry harangue.” Wikipedia, which proves useful in understanding these types of concepts, defines the concept a bit more succinctly: “bitterly laments the state of society and its morals in a serious tone of sustained invective, and always contains a prophecy of society’s imminent downfall.” Their definition seems to work well with the dictionary; plus, the entry also notes that the word has Biblical roots: it comes from The Book of Jeremiah and Book of Lamentations. Both definitions provide a good foundation for what I’m about to discuss. In his book, Cobb returns repeatedly to what he considers the American jeremiad, focusing intently on what mainstream American society complains about and who is often scapegoated to satisfy these complaints. This jeremiad fuels anti-gay rhetoric on several levels. For Cobb, our Nation is constantly in a power struggle, wherein, as a nation, we always have an enemy, both within and without, and in order to mark our enemies as such, we often use Biblical language to justify this stance. This is done, according to Cobb, because “religious language is thought to be a secure form of langue” (22). By this he means that the language has been tested and its meaning unchallenged. That is why, when someone cites a Bible verse, such as Leviticus 18:22, the meaning is understood without any detailed explanation needed (25). He finds this troubling because—and I agree—the Bible is a “textually unstable document, which must be translated, implied, refined, interpreted, and applied in very ingenious ways all the time” (23). If this is the case, how then can God’s word be “simple and true,” and something that cannot be challenged (23)? He sees this issue explaining, among other things, the troubling existence of the Westboro Church and their fanatical stance against homosexuality—they (and extreme organizations like them) cite scripture as their defense of their beliefs (and, by extension, actions). 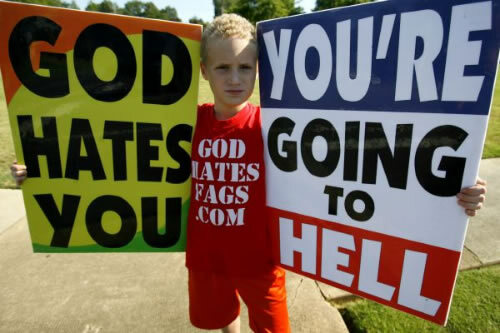 It’s worth mentioning that of all the opposition to gay rights in this country, hate-groups like the Westboro Church are an extreme example, and in no way do they represent the majority of religious organizations that don’t embrace/condone homosexuality. Still, it is worth looking at how any group (or person, for that matter) can rely so easily (i.e. without much of a challenge from the mainstream) on scripture in order to justify anti-homosexual beliefs. I’ll look more closely and his interesting points on how members of the LGBT community utilize race narratives to explain our existence, as it lends itself better to what Cobb has to say with regard to the work of James Baldwin as well as other writers he discusses in this first chapter. I will, however, close here with an analogy that wraps up the spirit of his argument. Those in power in our country, especially those in a religious position, who have enjoyed unchallenged power in various facets in society, are losing ground, in part because our society is shifting, with more diversity making up our population. Since most people don’t handle losing power well, they lash out. So here’s an analogy. These people are like children who have grown up as only children, then one day, a new sibling arrives, a human being with whom they must share their space, their toys, their parents’ attention. Some handle this well, some do not. The people in power who are looking for a constant enemy in order to shore up their dwindling power are like the spoiled child unwilling to share. The shame is that if they’ve understood the Bible, they would know that God and Jesus had enough room (and love) for all. 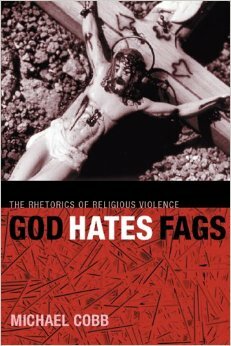 This entry was posted in Michael Cobb's God Hates Fags and tagged Anti-gay rhetoric, Bible, Brad Windhauser, God Hates Fags, Michael Cobb, Westboro Church. Bookmark the permalink.